Shem turned twelve-years-old on March 6. Shem was born in Syracuse, NY and he is an amazing kid. Saturday, Shem had a whirlwind baseball day. He started the day with his first baseball practice of the season. This is his first baseball season in Las Vegas. He is on the Paradise Valley Little League Cardinals (Major division). Straight from his practice, we went to Cashman field. This past weekend was Major League Baseball Weekend in Las Vegas. The Chicago Cubs played the New York Mets in a spring training game. Shem and I rooted for the Mets and the Mets won 9-4. 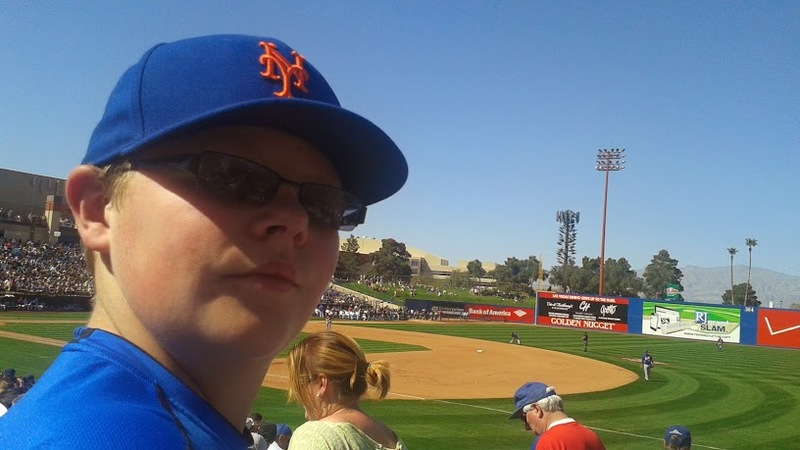 Our local team is the Las Vegas 51s, the AAA affiliate of the Mets, and Shem and I plan on attending their games regularly. Sunday, Shem was ordained as deacon at church. For LDS boys, entering the Aaronic Priesthood, as a friend recently described it, is a lot like a Bar Mitzvah…without the party. Shem is excited…and nervous. He is not sure if he will pass the sacrament correctly to the congregation. Passing the bread and water to the congregation each Sunday during services is the primary responsibility of the deacons. My assurances that there really is no way to do it wrong have not completely put him at ease. When he actually gets to participate in it next week, he will feel better I am sure. I had the privilege of placing my hands on Shem’s head and conferring upon him the Aaronic priesthood and ordaining him a deacon. I also got to teach the lesson later during his first deacons quorum class. In our class we talked about forgiveness and watched the new video about mercy and bullying. I am proud of my boy. The best part of baseball season is the time I get to spend with him.